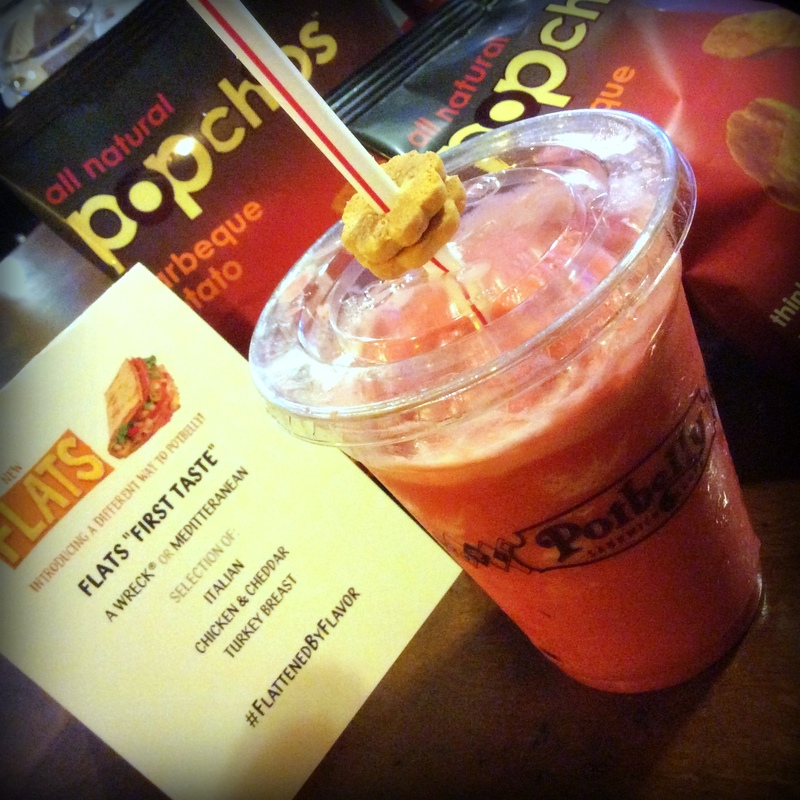 Get “Flattened by Flavor” with Potbelly’s New #Flatbreads! Is the old white bread rigamaroll bringing you down? We have developed a forever love of Potbelly’s whole grain bread subs (sorry Subway ) that keeps us coming back for the skinny mushroom melt and the vegetarian Mediterranean. But what’s this? 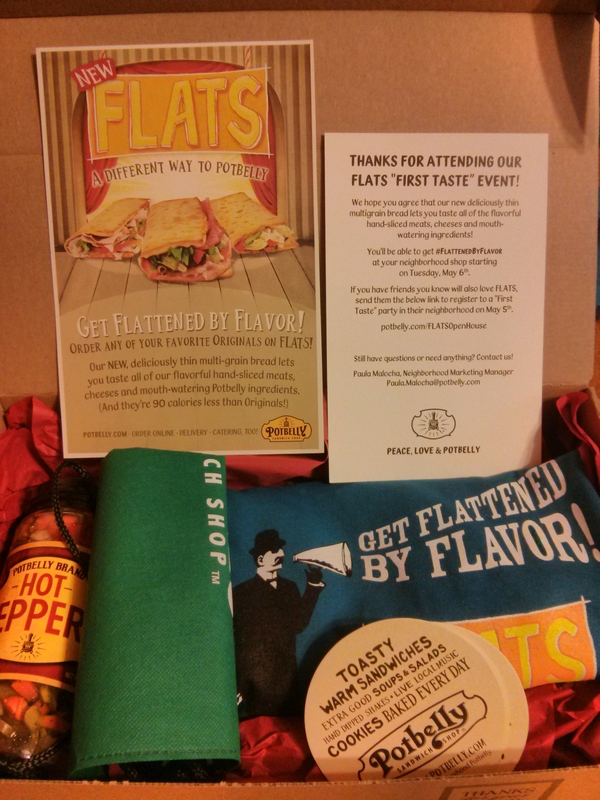 Potbelly has unveiled a new bread experience: the flatbread gloves are off and Potbelly is ready to battle. Last Thursday, we had the privilege of tasting the new multigrain flatbreads with the toppings of our tried and true sandwich stars. And boy howdy does Potbelly know how to make you feel special! Bottles were popping and flatbreads were flowing. Ok well, actually the new frozen raspberry lemonades with the tiny shortbread cookies on the straws were popping. We can dream right? Once we checked in, we walked upstairs to the VIP lounge. Each table had several snack bags of BBQ Popchips awaiting our arrival. 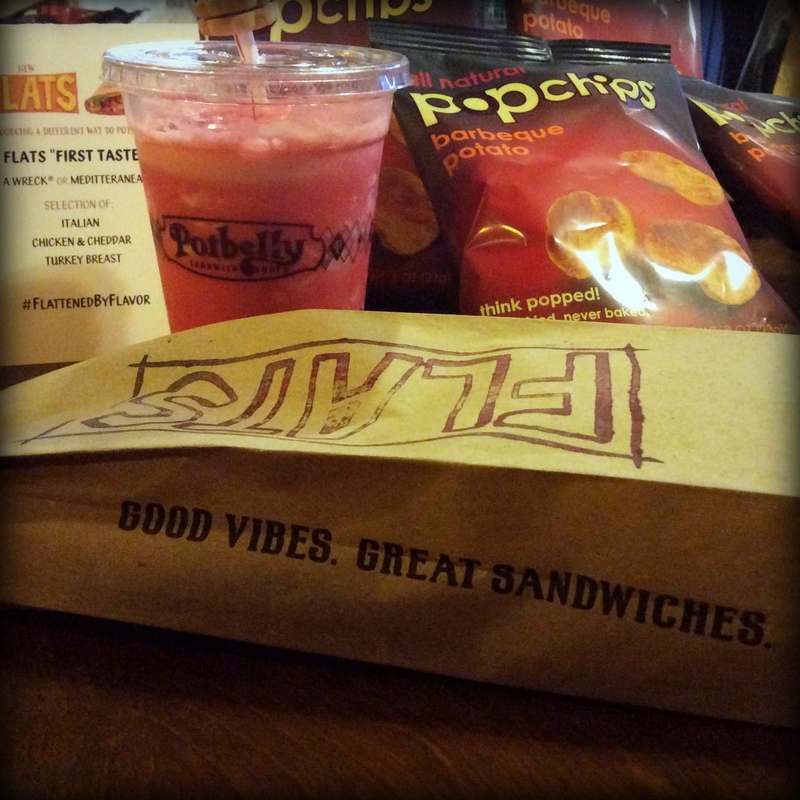 Potbelly staff walked around with samples of the several types of sandwiches on the new flatbread. We both tried a full sized veggie Mediterranean and Kate nibbled the tiny sized grilled chicken and cheese. The Wreck, Turkey and Tuna on the flats were also available but we didn’t partake. 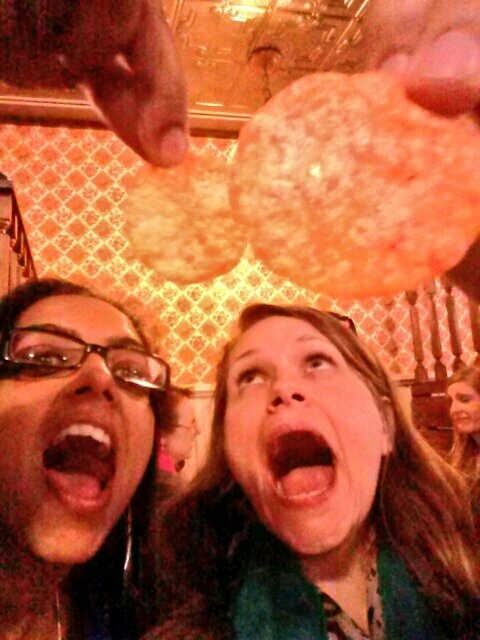 After we gobbled down our sammiches, we delighted in a “Drop the Popchip in your mouth” competition. Nutrition: With 90 calories less than Potbelly’s traditional breads, the flatbread is a solid nutritional choice for somebody watching the waistline while craving a sammitch. Taste: We are a big fan of the skinnys as too much bread can be overwhelming. The flats had a mild multigrain flavor, not too overwhelming. They have a nice balance of outside crunch and inside softness as well. The raspberry lemonade was off the chain tasty but our guess is it is not on the health conscious list. For a nice summer treat in 80 degree weather, it would alrighty but not the best idea in addition to a cookie, chips, sandwich, shake…hehehe…although light and airy Popchips are a good choice if you just hafta add the chips. So when can you grab the flats and flatten them out? Flats go national wide on May 6 and the yummy lemonade hits stands in June. Looking forward to trying it!! !